I am 5/8 Cherokee and registered with the Cherokee Nation of Oklahoma. I was fortunate to apprentice with Anna Bell Mitchell in the Spring of 1999. Anna is credited with establishing “Southeastern Mississippian Traditional Pottery” as a fine art form in Oklahoma around 30 years ago. Up until that time, the local art shows did not recognize this style as a fine art, but merely a craft. 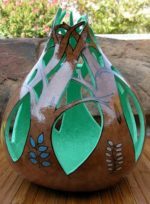 Today there are at least a dozen potters in Oklahoma, that create contemporary pottery utilizing designs, shapes, and decorating techiniques consistent with documented prehistoric “Southeastern/Temple Mound” styles. The Five Civilized Tribes today are educating our own people about our traditional arts through educational programs and workshops. For me making pottery is a personal way of making a statemnt about my own culture and preserving a heritage. The Southeastern Tribes had a strong belief system that supported an orderly and predictable world of balance between the lower, middle and upper worlds. It was when men became impure and caused the world to become out of balance that the spiritual and ritualistic forces were called upon to ‘straighten things out’. This spiritualism is well documented in the pottery and shell carving designs that I love to study and research. It is my desire to continue to bring attention to this art through my own creations. I participate in major Indian Art Markets throughout the country such as the Heard Museum, Eiteljoge Museum, & Cahokia Museum Art Markets. Also Red Earth Festival and Santa Fe Indian Art Market, as well as the Cherokee Heritage Center Museum, Five Civilized Tribes Museum, & Creek Council House Annual Art Shows. I have been fortunate enough to win major awards in all of these shows and feel that I have helped bring needed attention to this beautiful art form.